I am so excited to share with your our absolutely favorite Christmas dessert! This cheesecake is TO-DIE-FOR! 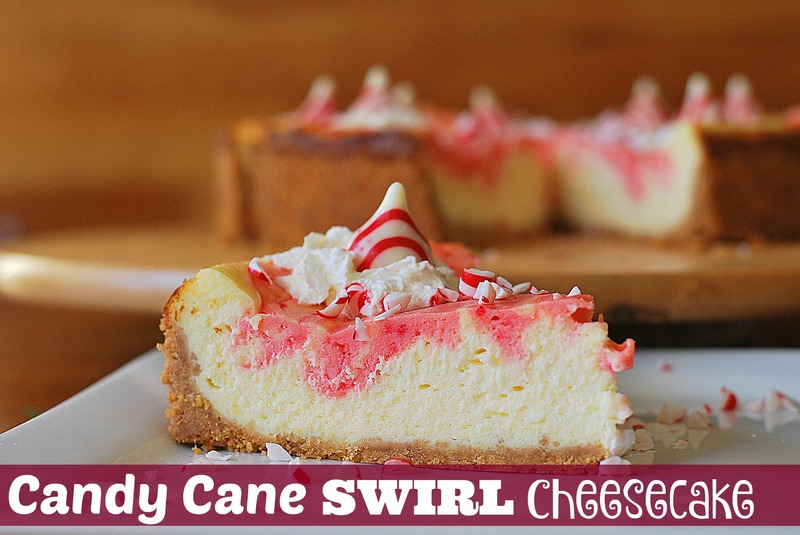 The peppermint taste is subtle, and it’s not TOO sweet for a cheesecake recipe! It really is the perfect dessert! I fill our buggy up with the candy cane hershey kisses the second they make their appearance at the store. To eat by themselves, and make this delicious holiday treat! A special thanks to my wonderfully talented sister, from Jamie Findley Photography, for the shots of our cheesecake! Didn’t she do a fabulous job? Click here for our favorite EASY Classic Christmas Treats that are great for cookie swaps or gift giving! Heat oven to 350°F. Prepare COOKIE CRUMB CRUST by stirring together cookie crumbs and melted butter in a medium bowl. Press mixture onto bottom and 1/2 inch up side of Pam sprayed 9-inch spring form pan. Bake 8 minutes; cool. Beat cream cheese, sugar and vanilla in large bowl until smooth. Add eggs, one at a time, beating well after each addition. Set aside 1/4 cup batter; spread remaining batter in prepared crust. Bake 45 to 50 minutes or until center is almost set. Remove from oven to wire rack. With knife, loosen cake from side of pan. Cool completely; remove side of pan. Cover; refrigerate until chilled. Garnish with whipped cream and remaining candies. Cover; refrigerate leftovers. Makes 12 servings.